Professor HyungJoon Cha of the Department of Chemical Engineering has devised a new technique which combines Mussel Adhesive Protein (MAP) and antibody-binding protein to pin down an antibody on diverse surfaces coated with a new linker protein (BC-MAP). BC-MAP is a linker material to immobilize y-shaped antibodies onto immunosensors such as a pregnancy test which examines for infection by antigen-antibody reaction. In order to work properly, antibodies are supposed to be exactly immobilized onto surfaces. Previously, antibody-binding protein did not immobilize an antibody depending on the surface. However, the research team overcame this by adding fusing MAP with domains of protein and found out it is six to ten times more adhesive than previous linkers. 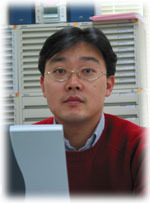 Prof. Cha explained that the new linker can be applied for research, environment, food, and defense industry. His paper, entitled “A mussel adhesive protein fused with the BC domain of protein A is a functional linker material that efficiently immobilizes antibodies onto diverse surfaces,” appeared in the Advanced Functional Materials published online on Aug. 31.